Notes: Among women 18–64 years of age. Abbreviations: BRCA = breast cancer (gene); CPT = Current Procedural Terminology; HCPCS = Healthcare Common Procedure Coding System. The denominator is the total number of women aged 18–64 years enrolled in MarketScan Commercial Claims and Encounters databases at any point during that year. 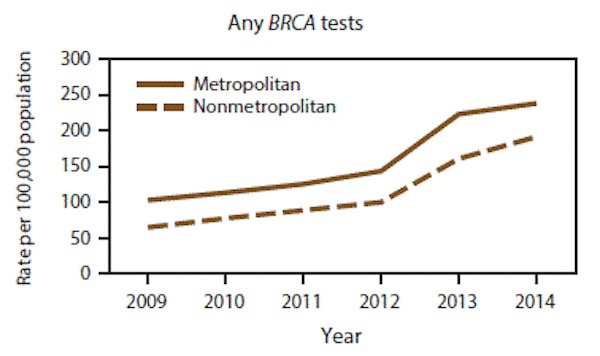 Three subtypes of BRCA tests were defined based on the following billing codes: full-gene sequencing (CPT codes 81211, 81214, and 81216 and HCPCS codes S3818, S3819, and S3820), known mutation tests (CPT codes 81215 and 81217 and HCPCS code S3822), and large rearrangement tests (CPT code 81213). The specific billing code for large rearrangement tests was introduced in 2012. Data Source: Truven Health Analytics. Truven Health MarketScan research databases, commercial claims and encounters Medicare supplemental, data year 2009–2014. Ann Arbor, MI: Truven Health Analytics. http://truvenhealth.com/markets/life-sciences/products/data-tools/marketscan-databases. This entry was posted in Medicine and Society Data Watch on September 13, 2017 by Genevra Pittman.